What is Dissolved Air Flotation (DAF)? "Dissolved air flotation (DAF) is a water treatment process that clarifies wastewater's (or other waters) by the removal of suspended matter such as oil or solids. The removal is achieved by dissolving air in the water or wastewater under pressure and then releasing the air at atmospheric pressure in a flotation tank or basin. The released air forms tiny bubbles which adhere to the suspended matter causing the suspended matter to float to the surface of the water where it may then be removed by a skimming device. Dissolved air flotation is very widely used in treating the industrial wastewater effluents from oil refineries, petrochemical and chemical plants, natural gas processing plants, paper mills, general water treatment and similar industrial facilities. A very similar process known as induced gas flotation is also used for wastewater treatment. Froth flotation is commonly used in the processing of mineral ores." Dissolved Air Flotation has been used for decades in the treatment of industrial wastewater and due to its high efficiency is gaining a large user-base in other industries for the removal of oils, fibers, blood, and other light items in suspension that do not settle well under normal operating conditions. By use of a special Impeller design, the pump creates microbubbles less than 30 microns that attach themselves to particulate matter for flotation and easy removal by skimmers. These bubbles are so microscopically small they can barely be seen normally by the naked eye. It produces a "whitewater" effect. Literally making the effluent water being treated look as if it has a fine smoke coming up through it. These Particles remove the waste from the wastewater. 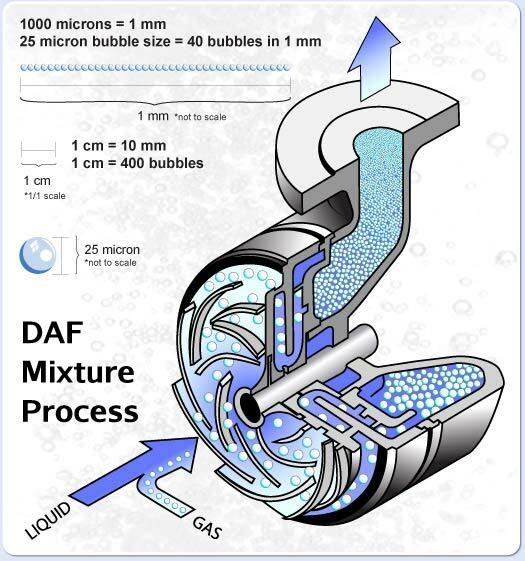 Additional uses for DAF liquid-gas mixing is in the field of Ozone-sterilization. Ozone sterilization by dissolved air flotation is used in the fields of bottling, water sanitization, food production, livestock production and even electronics manufacturing! The small Micro bubbles of Ozone act as a sterilizing agent that kills bacteria on contact and more importantly is environmentally friendly. The EDUR is used to control the amount of ozone added to the process eliminating further controls. 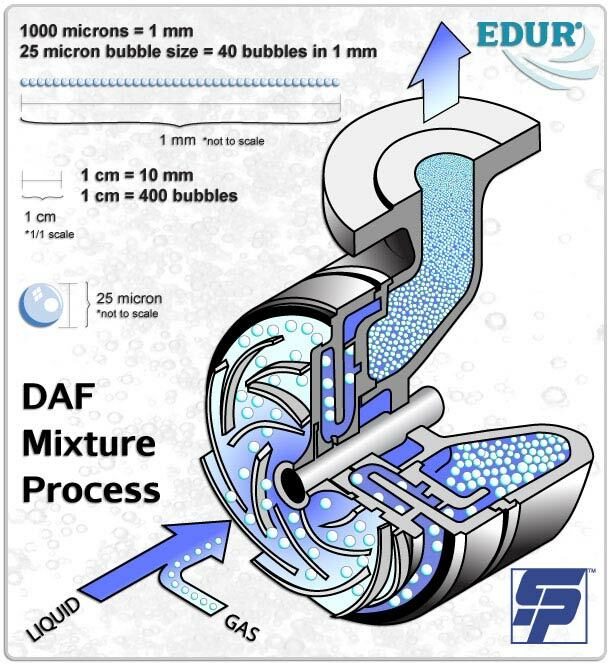 The EDUR PBU DAF Pump is ideal in this application. Centrifugal DAF Pumps from EDUR also are highly energy efficient as well as giving the user the ability to remove many other pieces of equipment a traditional DAF system would use including compressors, storage tanks and venturi's as well as control valves in ozone systems. Shanley Pump and Equipment, Inc. represent the EDUR line of Centrifugal Dissolved Air Flotation pumps for Liquid-Gas Mixture pumps for immediate shipment throughout North America. Contact us today for more information as to how our EDUR Dissolved Air Flotation pump system can help you.